1. The very successful organics recycling program that includes vendors. With the mighty efforts of over 120 volunteers a day, they achieved a perfect 100% acceptance of sorted waste at the region in 2017. 2. Singfest is their local talent competition held each year where Mississauga youth perform in the gazebo. The final round of performances happens Saturday, July 14th. 3. Volunteering power sees a whopping 4,000 hours a year go into this amazing fundraiser. 4. 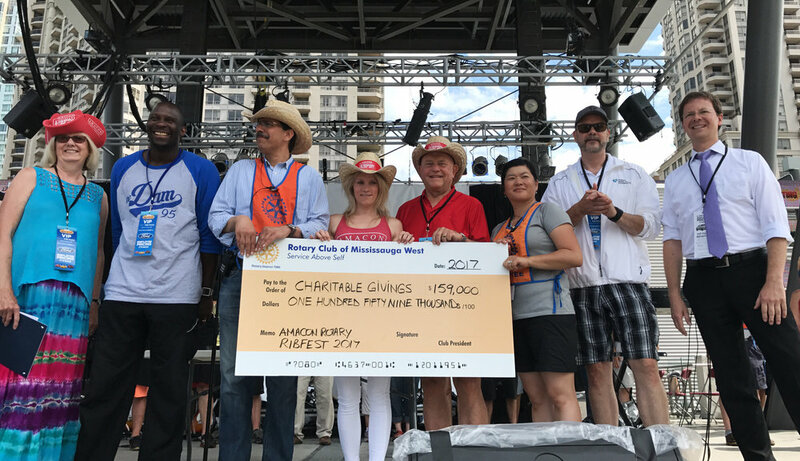 Ribfest is a fundraising event supporting the charitable projects of The Rotary Club of Mississauga and The Rotary Club of Mississauga West. Over 1.3 million dollars have gone back into our city. 5. When they say #biggerbetterbolder they mean it. Their new home at Port Credit's Memorial Park is 40% larger, providing much more space to add in more fun, food and fundraising. 6. Last year, a team member walked more than 23 km a day during Ribfest! Now with a bigger venue, chances are there'll be a few volunteers and team members that'll eclipse the 30 km mark. 7. There will be vegan and halal options this year. 8. Rib vendors are referred to as "Ribbers." 9. You can enjoy Brussels sprouts this year. 10. Spontaneous dance-offs often occur late at night between Ribbers. 11. Ribfest requires building permits. 12. Oddly, they once had a golf cart stolen. More oddly, one year someone took off with a keg fridge. 13. A family planned their reunion at Amacon Mississauga Rotary Ribfest from England and India.